Happenings around the Island on the Columbus Day weekend. 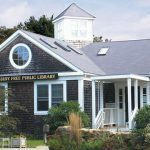 The library will be open in its new location on Monday, Oct. 15. The last day in the current location is Saturday, Oct. 13. 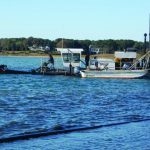 Edgartown contractor Norman Rankow paid a price for authorizing a dredge project for his clients, without necessary permits. Cycle Martha's Vineyard, a 50 or 100K recreational ride around the Island, is set for Sunday, October 14. Following an impressive showing in New Hampshire last weekend, the boys cross-country teams were even better in Rhody. The M.V. girls also improved. The Polar Bears of Martha's Vineyard is a 70-year-old social organization that promotes the joys of our early morning swim and fellowship at the Inkwell Beach in Oak Bluffs. A voter registration form must be submitted to the town clerk by Wednesday, October 17.
Who's keeping secrets? Mitt Romney has issued only one year of his tax returns and seems determined to keep it that way. In 2007, Michelle Obama stated, "For the first time in my life I'm proud of my country. Would you give matches back to a known arsonist who had torched your neighborhood? Don't give the matches back to the Republicans. In the Calendar section of your September 27 edition, there is a very good article by Gwyn McAllister concerning the Alexandra Gagnon Teen Center, now known as "Alex's Place. The Martha's Vineyard Vision Fellowship is concluding its sixth successful year of investing in people and organizations on the Island. I was extremely surprised when the Oak Bluffs selectmen decided to hold their town meeting on the evening of Yom Kippur, the most important of the Jewish holidays. Last week, the Vineyard Nursing Association reached an historic and major milestone. The letter below is a response to an online comment about the September 20 Times article about Ted Box and the Seeker [The Seeker of Vineyard Haven - a scow schooner by Ted Box]. I've sent the following to the West Tisbury selectmen. I have lived on Martha's Vineyard for 20 years and could not be more proud to call this Island home.